Reviewing DVDs is always a tough call, because you have to decide which you are reviewing; the series, or the DVD itself? In this case, the series is good, while the DVD is so bad it is insulting. Like I said, Young Justice is good. It isn’t great. I don’t like it as much as Teen Titans, which was tons of fun, mixed classic Titans stories with wacky hijinks, and had its own style and identity. 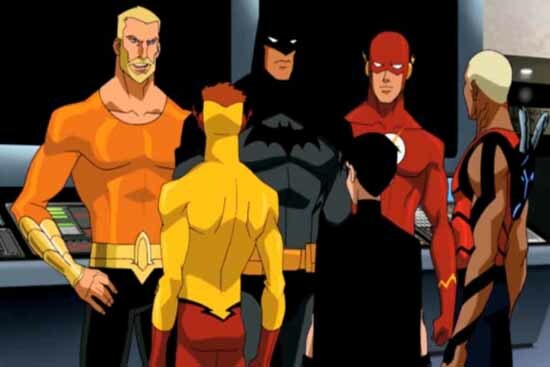 I don’t like it as much as Justice League, which to my mind is the greatest DC animated series ever made. 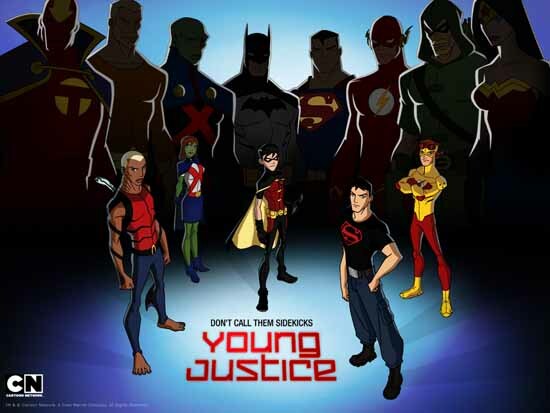 Young Justice has a promising start, and I suspect it needs some time to flesh out its characters and its series. Supposedly, Young Justice has been renewed for a Season Two next year, which is a good thing. 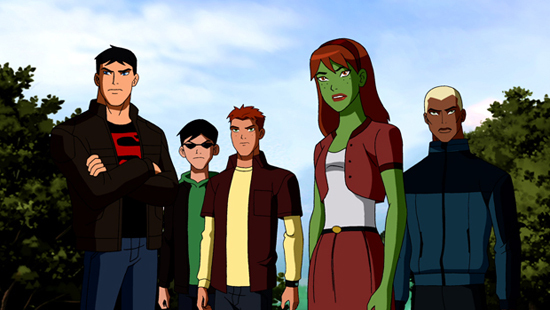 Young Justice is firmly set in the DC Universe (Earth-16 for the uber-geek), although in an emo-teen-angsty corner of it. The Justice League makes regular appearances, with Red Tornado and Batman being the most active. Cadmus is set up as the main villain, along with a decent rogue’s gallery like Kobra, Blockbuster, Bane, and Sportsmaster. I liked the nod to Mister Twister as well, the villain who battled the original Teen Titans from the 1960s. The series starts when the sidekicks Speedy, Robin, and Kid Flash get sick of being seated at the kid’s table and storm off in a huff to form their own supergroup. Speedy decides he is too cool to be part of a junior Justice League, but Robin and Kid Flash pick up a new member in the new Aqualad. They soon break into Cadmus and accidently rescue the Superboy-clone, and then the Martian Manhunter drops off his niece and protégé Miss Martian to join the team. The team has a different dynamic than what I am used to. Instead of being the in-control, calm-headed, raised-by-Batman-natural leader, Robin is the epitome of a whinging teenage jerk who thinks he is cooler than he is. I am used to Robin being the steadying point of any teen group, so it was odd to see this little upstart punk who rarely looks before he leaps, and gets the team into more trouble than he solves. Even his voice has a nasal whine to it, reminiscent of Casey Casum’s classic Superfriends Robin. Instead, both Superboy and Aqualad (Not the classic one – This one has some sort of Green Lantern-inspired omni-power using water constructs) are the mature members of the team who think of planning and caution. Kid Flash is typically the comic relief; a stereotypical hothead speedster. Miss Martian is an intriguing character, because I know so little of her from the comics. She has good potential, but I was disappointed that the prominent female member of the team, even though she is incredibly powerful, is played as such a “pretty airhead”-type. She mainly serves as a romantic-triangle foil, with Kid Flash making mooney-eyes at her while she goes for the strong and silent Superboy. The other female character, Artemis, does not appear on this DVD and debuts later in the series, so I don’t know how that dynamic will change. Four episodes? Seriously? That’s all you are going to give us, Warner Bros? Out of a ten-episode Season One, you thought it was a good idea to split off the first four episodes into Season One, Volume One? What are you going to do with the remaining six episodes? Put out another Season One, Volume Two boxset then a 2-episode bonus disk? Whatever. 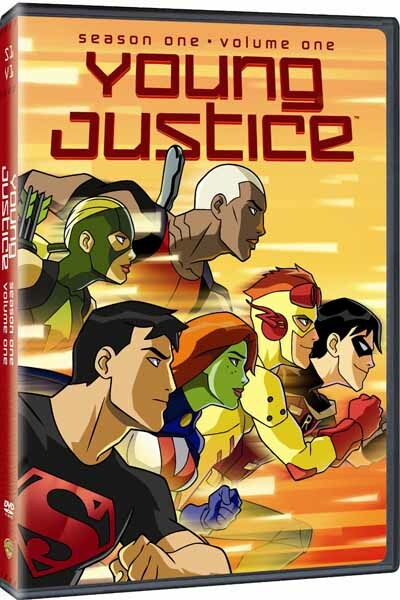 We all know that eventually, Young Justice will be collected into an actual Season One collection, and for less money. My advice would be don’t buy this. Vote with your dollar, and don’t support this kind of studio nickel-and-diming of their series. Be patient, save your money, and pick up the REAL release when it comes out.